Complete UHV vacuum system with 2 customized loadlocks. 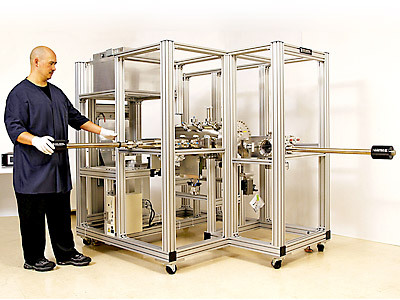 One loadlock is for delivering 300 mm wafers to a linear/rotary positioning stage, and the other is capable of delivering a small sample holder to a fixed position within the vacuum chamber. This system is designed for studying outgassing properties related to materials of use in EUV Lithography. The linear/rotary stage with our UHV compatible limit switches is hard UHV compatible. The 300mm loadlock was designed with a pneumatic side door to allow a robot to feed wafers in from an EFEM.